The purpose of research is to study the impact of use the management accounting on financial performance and organizational performance in Tafresh medical sciences university. The participants of this research are all of the financial experts are in arak medical science university. The number of samples analyzed was 150, a standard data collection tool is in the study questionnaire Masinati and Pesina. For data analysis used from lisrel software, the research is including 7 hypotheses. Results of research hypothesis examination suggested that is organizational strategy has the positive impact on design of management accounting but not effect on the use of management accounting. Also design of management accounting not effect on use of management accounting. But all of dimensions of management accounting have the positive impact on financial performance and organizational performance. The environment ongoing rapid change, increase competition and the need for deliberate decision has led to the concepts of management accounting needs revisions and reforming such as other fields of science of management. The traditional accounting concept has changed by the introduction the strategic thinking based on different field of management. Then, strategic management strategic accounting has been proposed as a means for generating advantage of sustainable competitive. Management accounting is a system for collecting and storing data, so that, after the processing data; the data being used has been generating, finally management accounting system. Management accounting and organizational strategies have closely related to each other. Process of formulation and implementing strategies in organizations are carried out by the technique and the form of language. Mutually, process of decision making strategies will affect the design and implementation of system as one of the control strategy symbol. Many researchers believe that in order to be successful in competitive advantages, it is essential to have obvious organizational strategies. Therefore, we need elements within the system to support the desired strategies such as, accounting information system and organizational production/structural process. Many researchers argued that assessing and evaluating the performance as one of the main role of management accounting. The researchers for evaluating the performance of management accounting used the set of financial and non-financial technique and instruments. According to the definitions, performance measurement system is a comprehensive system which is designed for measurement and evaluation of both financial and non-financial performance and organization's output. Therefore, this system enables organizations to developing standards that reflect the desired outputs of organizations, and then help the organization to measure and assess actual result's organization. Among the thirty known techniques in management accounting, budging and cost metrics-centered is very important. It is one of the most common methods being used by managers, although these two tools are supporting metrics. In recent years, the use of non-financial criteria was greatly increased, such as customer satisfaction and employee attitude. In this study, we investigated about the effect the use of management accounting on financial performance and the performance of the state university of Tafresh by using the Marinate and Saina's conceptual model. The aim of this study was to investigate the effect of using the management accounting on financial performance and organizational performance of Tafresh university. The theoretical framework in accordance with the Masinati and Persian’s conceptual model. This model review the following items: effect of the organizational strategy on management accounting design, the effect of management accounting on satisfaction of management accounting, the effect of using the management accounting on organizational performance, the effect of the management accounting on financial performance, and the effect of satisfaction of management accounting on using the management accounting. Hajiha and Nabiony, presented an article as the effect of the accounting information system characteristic on the system's performance. The results show that in the task analyzability conditions, gathering information in large scale with information system, increasing the management satisfaction of information system performance and manager satisfaction of accounting information systems performance. But in these conditions, providing information at the right time has reverse effect on manager's satisfaction of accounting system. In other words, when the organization’s functions are analytical, managers have accepted the aggregation and extensive accounting. But providing the information on the right time have a significant and reverse effect on their satisfaction. Roodposhti et al. in a research entitled "modernity and management accounting" have concluded that, management accounting, as a science, have evolved by entering into modern firms (enterprises). The emergence of the accounting technique caused by the economical firm’s activity in the modern environment. Jalili et al. investigated about the mental innovation in the use of (application of) management accounting procedure. They results shows that there is a reverse relationship between management applying management accounting technique and mental accounting, formalism and orientation of consistency. Molanazar et al. investigated about relationship between management accounting information with organizational learning and manufacturing performance. They results shows that, there is positive relationship between information provided by management accounting information system and improving the production efficiency . Gordon and Milz providing a framework with the accounting information system scheme. They were considered special needs of organization through describe the organizational theory literature and management policy. They suggested that the organizational structure and decision- making style as a variables. Each factor can be defined in accordance best condition of accounting information system (Figure 1). 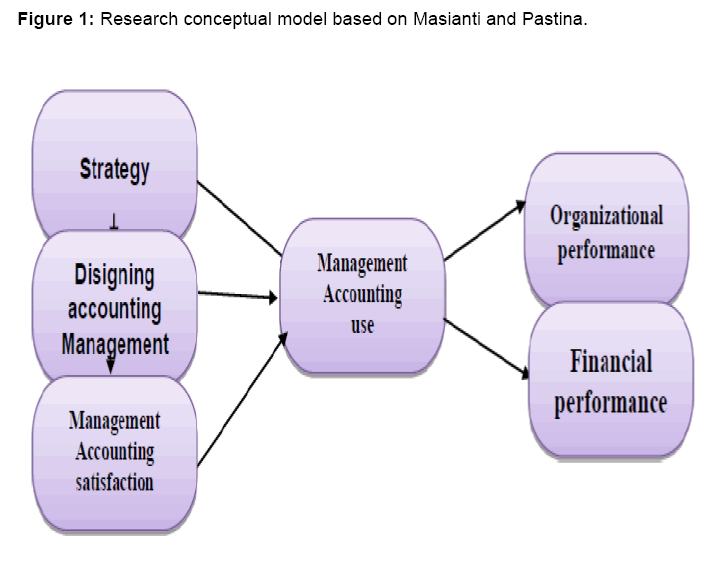 Figure 1: Research conceptual model based on Masianti and Pastina. The use of management accounting has a positive impact on financial and organizational performance on Tafresh University. 1. Organizational strategy has a positive effect on the design of management accounting at the University of Tafresh. 2. Organizational strategy has a postive effect on the using of the management accounting at the University of Tafresh. 3. Management accounting design has positive effect on using the management accounting at the University of Tafresh. 4. Management accounting design has positive effect on management accounting satisfaction at the University of Tafresh. 5. Management accounting satisfaction has positive effect on the using of management accounting at the Tafresh University. 6. The use of management accounting has positive effect on the financial performance at the University of Tafresh. 7. The use of management accounting has positive effect on the organizational performance at the University of Tafresh. This research was done in a six month (from1394 fall to 1394 winter). E location of this research was Tafresh University. The population includes 240 people that include financial experts of the Tafresh University and subset organization. With considering the potion that, the population are limited, the sample size was 144 which calculated by using Cohen's table, Morang and Kerjsi. We used simple random sampling method to select the samples [2-4]. At first, we must gathering information to implementation study, then, testing the hypothesis by using them. There are different methods and means for gathering information. These means have different type and describe the data with use of qualitative and quantitative methods. Each of the means was used for certain type of data. In the present study we used library method and field method. We used questionnaire for gathering information. This is one of the common methods in research because of its simplicity. Questionnaire is a set of question which respondent should be answered them considerate. Answer to this question contains required data for researcher. Our questionnaire consists of 23 questions which has 5 options according to the Liker model (Figure 2). Figure 2: Standardized factors of conceptual model. Data Analysis Method: We used SPSS software, structural equation and descriptive statistics for analyzing data. This study is applicable research. The results of this research were used to improve behavior, means and equipment. Type of method is Survey. In this research, we select the people randomly. In this study, review the relationship between dependent and independent variable (Table 1). Table 1: Fit indexes of research model. Indicators of overall fit show the good conditions. According to the Skooter model, there is no difference between variances matric. Adaptive index shows the value above 90% that means ability of the model to separate from independent model and approached to the saturated model. RMSEA and confidence interval are in the acceptable range. Hypothesis 1: Organizational strategy has positive effect on management accounting design. The results are tested by the information on the following Table 2. Table 2: Exogenous latent variable path coefficient of organizational strategy. Hypothesis 2 there is positive impact on management accounting in Tafresh University. The results of this hypothesis investigated in accordance the information in the following Table 3. Table 3: Exogenous latent variable path coefficient of organizational strategy. Hypothesis 3 there is positive relationship between the using the management accounting on the Tafresh University. The results of this hypothesis, investigated due to the information in the following Table 4. Table 4: Endogenous latent variable path coefficient of organizational strategy. Hypothesis 4 design of management accounting has positive effect on satisfaction of management accounting in the Tafresh University; there is a positive relationship (Table 5). Table 5: Endogenous latent variable path coefficient of organizational strategy. Hypothesis 5 satisfaction of the management accounting has positive effect on the management accounting at the Tafresh University. We analysis the results of this hypothesis, the variable coefficient path about the customer satisfaction by using of the management accounting B=95%, t=3.56, are significant. Reject the null hypothesis, so the hypothesis is confirmed (Table 6). Table 6: Endogenous latent variable path coefficient of organizational strategy. Hypothesis 6, the use of management accounting on financial performance is positive. We analysis the results of this hypothesis, the variable coefficient path about the use of management accounting B=0/93, t=4/33, level of error 0/05 and confidence 95%; are significant. So, the hypothesis is confirmed (Table 7). Table 7: Endogenous latent variable path coefficient of organizational strategy. Nowadays, for the organization can be active in a dynamic environment, and preserve their survival need the improvement their performance. The ability of the organization introduces as an important tool for improvement the financial performance’s organization. Therefore, gathering and providing information is very essential. It is accepted that manager's organization must be familiar with the role of every variable and the impact on each other. The results of this research are suitable for different groups of researchers, especially graduated managers. According our findings, elements of management accounting affected the financial performance. Therefore, suggested that accounting team pay attention to the factors affecting the management accounting. According the results and the impact of the management accounting element on financial performance, suggested that organization holding training course, management accounting executive technique, and teaching the employees and managers how to use of it. Due to the, positive impact of management accounting and applying them by managers, suggested that, by using the management accounting system improvement the firm's financial performance, and access to competitive advantage. According to the important role of the management accounting on improve the financial performance, managers can do more research about the efficiency and effectiveness of accounting system, and determine the importance of it. Roslender R, Hart SJ (2013) In search of strategic management accounting: theoretical and field study perspectives. Management Accounting Research. Jermais J, Gani L (2004) Integrating business strategy, organizational configurations and management accounting systems with business unit effectiveness: a fitness landscape approach. Management accounting research 15: 179-200. Mahama H (2006) Management control systems, cooperation and performance in strategic supply relationships: A survey in the mines. Management Accounting Research. Joshi PL (2001) The international diffusion of new management accounting practices: the case of India. Journal of International Accounting, Auditing and Taxation.